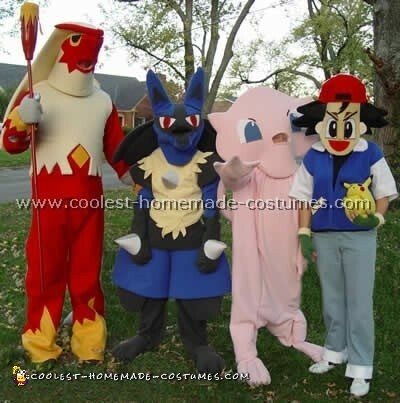 We had a great Halloween this year because we all dressed up in a Pokeman costume. This was the image that provided the inspiration for our costumes. It was a complete family effort, so much fun to create and totally worth the time it took to make these Pokemon costume designs because we have some awesome memories. My oldest son wanted to be Lucario. This Pokemon costume is so cool and was so much fun for me to make I loved it! To make Lucario’s Costume I bought two yards of blue fleece, two yards of gray fleece, one yard of yellow fleece and three pieces of white felt for the cones, a piece of red felt for the eyes and gray felt for shadows. I also needed two yards of ½” thick foam pillow stuffing, an old bike helmet and two hangers. I started with his pants and I cut pieces of ½” thick foam that go from the front middle to the back middle. This gave the foam the width it needed to flare out at the thighs. Then, I covered these with blue fleece. I cut out a tail from the blue fleece and sewed it up and turned it inside out. I placed it on a piece of foam and cut it that shape and stuffed it inside the tail so that it would have a real stiff appearance. To attach it to the pants I sewed one end of the hanger to the shape of the tail and then inserted the other end of the wire into a tube sewn into the pants. It worked great. 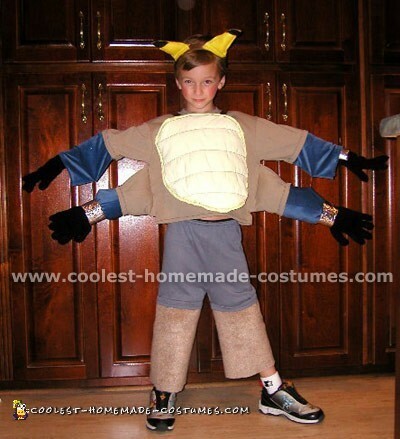 To make the legs of this Pokemon costume I got a pair of his jeans and used them as a template. I traced the legs only onto the fabric and cut them out of the gray fleece. Then I sewed these to a pair of boxer shorts so he could slip them on very easy. For the feet I freehand drew three large paws and cut them out of the gray fleece and turned them inside out and stuffed them with pillow stuffing and then added elastic to the bottom so that they could slip over his shoes and he could walk very easily. To make his shirt I used one of his long sleeve shirts as a template and traced around the middle part only on the yellow fleece. I then traced the arms on the blue fleece and sewed it all together. I left the back open for him to slip into it and added Velcro to close it easy. The final touches were to add the gray shoulder pads to his arms which were very simple I just covered a piece of foam with gray fleece. Little feathers were cut out of yellow fleece and added to the top shoulders and center bottom of the shirt to add dimension. It looked so cool. The cones that stick out from his chest and paws were made from the pieces of white felt rolled into a cone shapes and sewn together. They were flipped inside out and stuffed with pillow stuffing to give them their form and accented with gray felt to give it a shadow. I hand sewed these into their final positions. His paws were really fun to make. I had my son lay his hand on the gray fleece and I free handed three large paw shapes. Then I cut it out sewed it up and turned it inside out. I placed it on a piece of foam and cut it that shape a stuffed it inside the paw so that it would have a real stiff appearance. Then I added the cones to the top. Finally for the head piece of this Pokemon costume I used an old helmet and I cut a hanger in half and used the two pieces as the shape for his ears. I attached the hanger by heating up the ends and pushing them through the top of the helmet. Then, I wrapped them with foam and covered it with blue fleece and added the gray accents. I bent part of another hanger to extend out from the front to make the nose and then I added foam to make it square. I covered all of this with blue fleece and then added a gray fleece panel to complete his mask look. Then, I added the red and white felt eyes to make him come to life. The final touch was to add the four gray fleece accents that come out from the back of his head. They were stuffed with ½” thick foam to give them the ability to stick out to the sides. My youngest son wanted to be “Mew”. He says he is one of the cutest Pokemon out there! 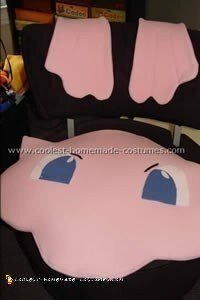 To make this Mew Pokemon costume I bought four yards of pink fleece and small pieces of white, blue and black felt. I also got two yards of ½” thick foam, a bag of pillow stuffing, pink mesh, elastic and a 60” long piece of foam pipe insulation from the hardware store. I started with making Mew’s head the width of the material approximately 30” wide and I just freehand drew the outline of his head on the material cut it out sewed it up leaving a gap at the bottom and turned it inside out. Next I cut two pieces of the foam in the shape of his head and stuffed them inside the fabric to make his head have stability. Once that was done I cut his eyes out of the white and blue felt and glued them on and then added his eyebrows out of black. Finally I had my son put it on his head and I found out where his actual eyes where and then I cut a slit for him to see out of and glued the pink mesh over the hole to make it look more finished. To cut out Mew’s body I had my son lie down on the floor on top of the fabric and I traced his outline. This made it so easy. 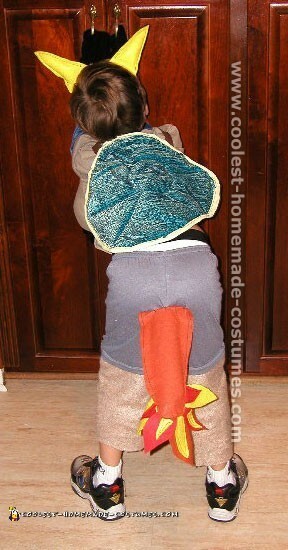 I just cut it out and sewed it up allowing a gap in the back for him to be able to get into it his costume. I added a button at the top to keep it nice at tight. For his arms I also added in a small piece of foam inside the costume to keep the form of his three fingers. 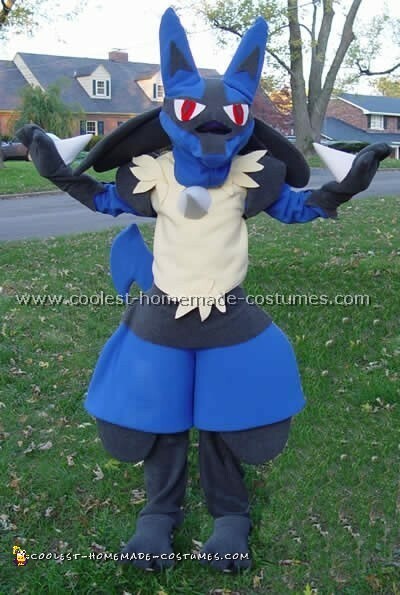 For the feet of this Pokemon costume I made these separate. I just freehand drew the shape and cut and sewed them up and stuffed them with the pillow stuffing to give them a fuller appearance and then I added some elastic at the bottom from one side to the other for it to slip over his shoe. I sewed the feet to the bottom of his legs and it made them very easy to walk in. Finally I made Mew’s tail. I cut the fabric to fit around the entire width and length of the foam pipe insulation. Then I sewed it up and turned it inside out and slipped it over the foam piping. I sewed one end to the body and the other I stitched to the top (by his neck) making sure to have it very curvy in the middle. Then I cut out the tip of the tail, sewed it, turned it inside out and filled it with ½” foam to make sure it kept its form. My husband who is such a great sport dressed up as “Blaziken”. He looked so awesome in his Pokemon costume. To make Blaziken’s costume I bought three yards of red felt, three yards of cream felt, one yard of yellow felt, ½ yard of gray and white felt and a piece of black felt. I also needed three yards of ½” thick foam pillow stuffing, a wicker tiki torch and red spray paint. This costume seemed a little overwhelming at first so I started with his pants. I knew these would be so easy and they were. I placed a pair of his sweatpants on top of the red felt and traced them, cut them out, sewed them, put elastic at the top and hemmed the bottom and I was almost done. Then, I added the yellow felt by cutting a piece just below his knees and sewing it into a tube shape so that it would fit over the red pant leg. I freehand sketched the jagged shapes cut it out and glued it on. Gray Cones were added to back of the pants by rolling foam into a cone shape and covering with gray felt and hand stitching them on. To make the shirt piece of this Pokemon costume, I used one of my husbands vests as a template. I cut the ½” thick foam in the shape of his vest but made it to open in the back. (I did not use the foam on his arms just for the middle piece.) Then, I cut the diamond pieces around his waist to match the photo of Blaziken and cut the cream felt to cover the whole thing. I actually did not sew this piece; I used the glue gun to adhere the felt to the foam. This made it really easy. I then used one of his shirts as a template for his arms and cut them out of red felt and sewed them on and cut a red strip out of felt and hot glued it to the bottom of the shirt piece. Little red feathers where cut out and glued on to give added dimension to the front. The whole back of this shirt piece was open and I sewed Velcro on it to make it easy to get in and out of. The final touch for this Pokemon costume was to add the diamond accent out of yellow felt on the front. His paws were really fun to make. I had my husband lay his hand on the gray felt and I free handed three large claw shapes. Then I cut it out, sewed it up and turned it inside out. I placed it on a piece of foam and cut it that shape a stuffed it inside the paw so that it would have a real stiff appearance. I cut two strips of red and yellow felt and sewed them together in a tube shape to fit over the paw and then I cut jagged spikes to make it look like the fire was coming out of his wrists then I hand sewed these to the paws to keep it secure. To add the white tips on his claws I took some white felt and sewed it in the shape of a triangle. I turned them inside out and stuffed it with a little pillow stuffing and hand stitched them on the ends of the claws. They looked great. Finally for the head piece of this Pokemon costume, I made a tube shape cut out of ½” thick foam to fit over my husbands head and then I glued it down at the top and covered it with cream felt. The top piece was a triangle shape piece of ½” thick foam that started at a point above the forehead and went over his head and connected with two three foot long pieces of ½” thick foam with three scallops at the bottom to be the feathers that go down his back. I cut a continuous piece of cream felt to cover the entire shape making it look seamless then I sewed on top of the felt to give it dimension it needs and added a small accent to look like more feathers. Then a piece of red felt was sewn into a tube and stuffed with pillow stuffing and added to the top triangle shaped piece. I added the mask over his eyes to match Blaziken’s picture by using red yellow and black felt. Blaziken’s staff was made from a tiki torch that I spray painted red and added some yellow felt to look like flames and added a flash light in the middle to light our way for trick or treating on Halloween night. This Pokeman costume was time consuming but well worth it to have him included in the kids Halloween night! They loved how he looked. I dressed up like “Ash” the Pokemon trainer. To make Ash’s Costume I went to our local goodwill store and found everything that I needed for this Pokemon costume. 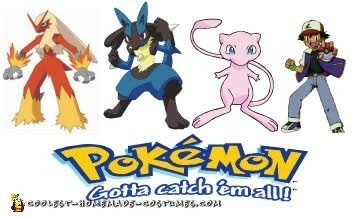 I found blue pants, black shirt, blue jacket, white shoes with a black stripe and a Pokemon stuffed toy. Wow! The items that I still needed where about a yard of ½” foam for the head , ½ yard of white felt and a piece of red yellow and black felt, black spray paint and a pair of green gloves. I started with making Ash’s head the width of my face. I free handed the design including his ears on the front piece of foam. Then I used the red felt to cut out the shape of his mouth and white and black felt for his eyes. I cut a scrap piece of foam and made a cute little nose and glued everything on. Then I cut out jagged shapes of foam for his hair and glued them all together and cut out a final piece for the back of his head. I spray painted it all black and glued on the face. For the hat of this Pokemon costume, I took a piece of red felt and white felt and sewed it in a half circle and placed it over the foam head and glued it on. The back red rim was done with a semicircle of foam and felt and glued on so that it stuck out. The final touch on this Pokemon costume was to add Ash’s symbol out of green construction paper to the back of the hat. Once I got it done I put it on and located my eyes and cut out the strips which are located above Ash’s eyebrows so I could see to walk. For his jacket I took the blue jacket from goodwill and cut off the arms and used them for the pattern to cut out white felt short sleeves arms and I sewed them together. I also cut a white collar and sewed it on and used rectangular pieces of the yellow felt to add pockets on the jacket. Then I took the pants and added a strip of white felt to the bottom to make it look like Ash’s cuffs. This was so super easy to do. For his green gloves I found at Target. I cut off the tips and added a strip of yellow felt at the wristband. The final touch for the boy’s costumes was to make a Pokemon treat bag. I bought two pop up bags and covered them with leftover felt to look like pokey balls. 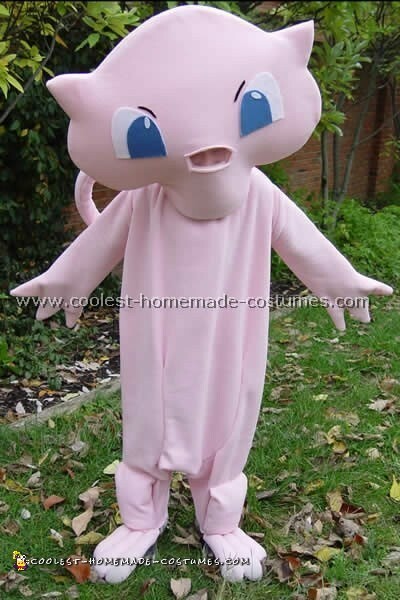 This Pokeman costume was so easy and super quick! We had so much fun making these homemade Halloween costumes and it was fun walking around the neighborhood and people yelling “Wow, look Pokemon”. We all had such a great time together! I hope you have a fun time looking at our whole family’s homemade Halloween costumes and good luck with your own costumes. 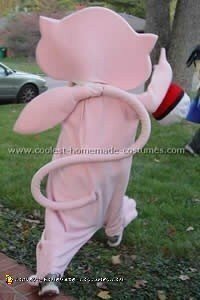 My daughter’s great aunt made this MewTwo costume. She used a McCalls MewTwo pattern and light purple and dark purple fleece. When using the materials list, we found it called for way more material than we needed so the costume actually cost about $30 to make. My daughter loved it and still uses it to play in. It was well worth the money!